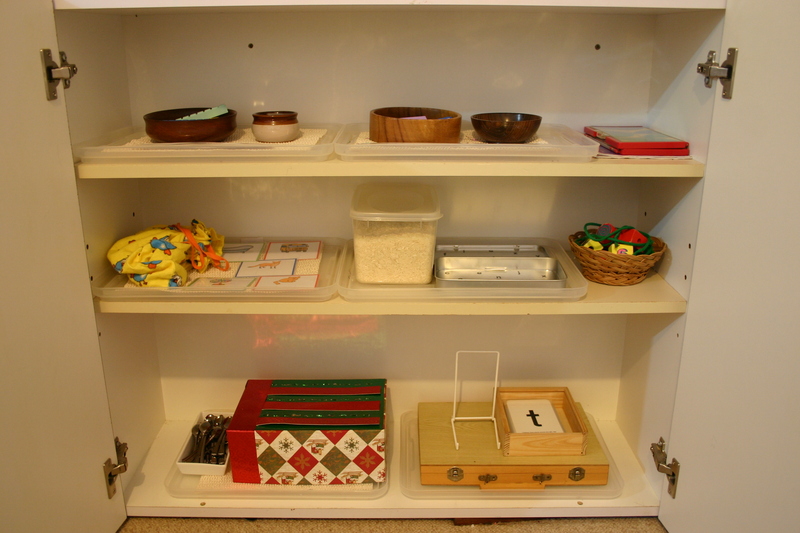 Preschool at our house – ready for a new baby! Here is the latest change-over for the twin’s preschool activities for homeschool time each morning. We are currently taking a school holiday break for 2 weeks, leading up to the birth of our 7th blessing. I have found from experience that everything goes much more smoothly if we continue with school, rather than take a break at the same time as the newest arrival. Too much free time and lack of structure and supervision creates cranky kids who bicker all day and drive me crazy! I have made sure that the activities for this term do not require a lot of 1 on 1 time with Mum and the older children especially are able to work through without requiring my assistance, other than for the occasional question etc. 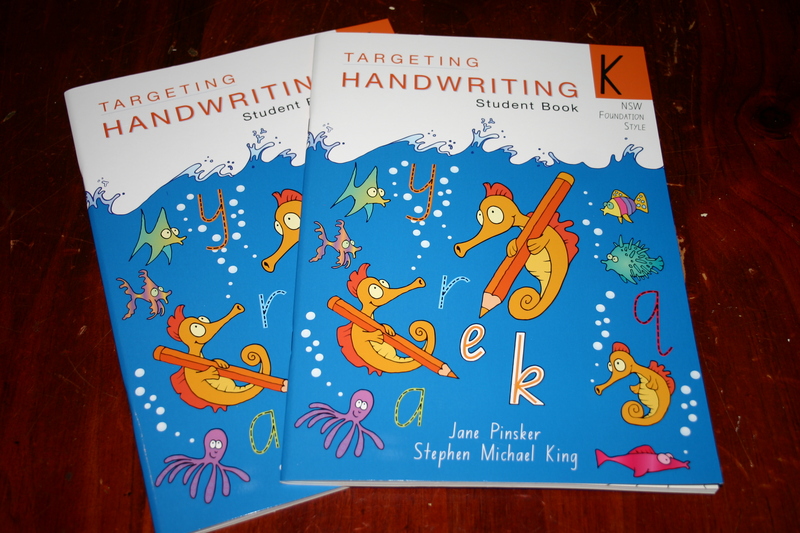 These handwriting books are the one item in the preschool cupboard that will need my 1 on 1 attention. The twins are asking me how to write certain letters now and are keen to write their names. My opinion is that if they are going to write letters, they may as well learn how to do it properly right from the start, rather than need to re-learn later and correct bad habits. I should be able to fit in the 15 minutes or so that is needed to complete 1 page per day. I picked up some old activity books with dotted pictures. Tracing these dotted lines to make the figures is great fine motor practise. I have removed the pages from their covers so that the twins can easily grab one page at a time. I also found some old sticker books. Again, I pulled all the pages out so that they can choose one at a time. Some paper to stick them on to and a packet of textas is all that is needed for some creative fun. I have had these pattern block puzzles out before but the children do not choose to do them unless directed to do so. 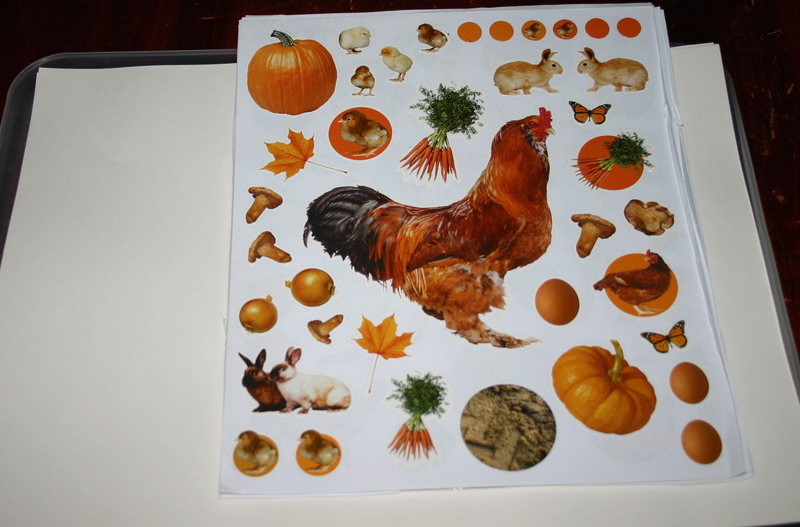 I have made a list of each picture with space for a sticker or stamp next to each one. After finishing a puzzle they can mark it as completed by stamping or sticking next to the corresponding name. A little added incentive! Cutting and gluing are still exceedingly popular with both children. 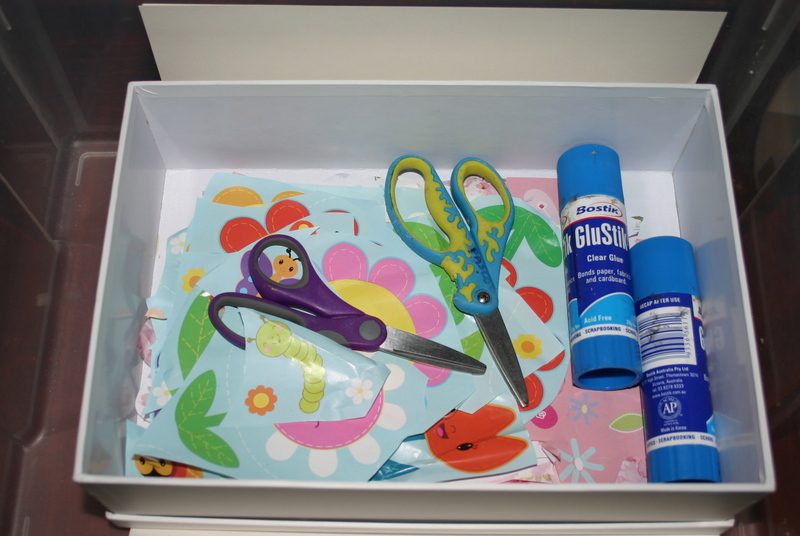 This box has some large plain paper sheets, wrapping paper pictures, glue sticks and scissors for free creating. A carry on from last month – matching upper and lowercase alphabet letters. More work is needed on this skill so I have just changed the presentation and popped it back out again. 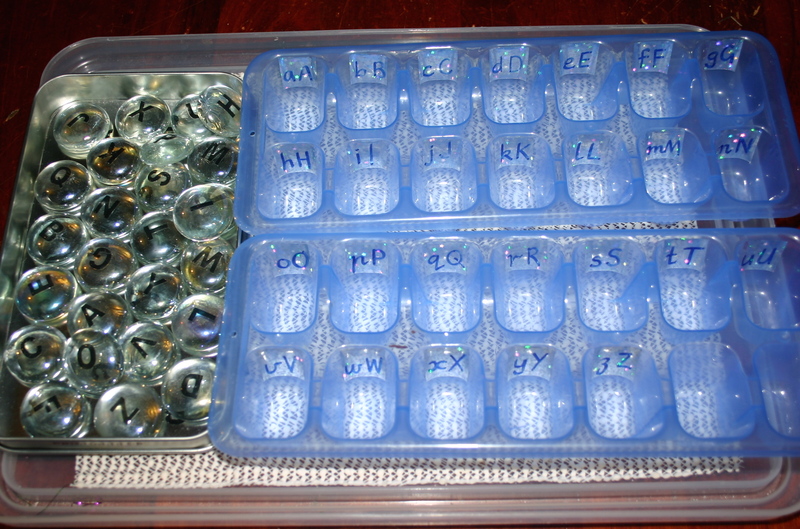 The large jewels have capital letters on them and the ice block trays have both upper and lowercase. It is a basic matching activity. Addition and counting skills will be something we continue to work on for a while. 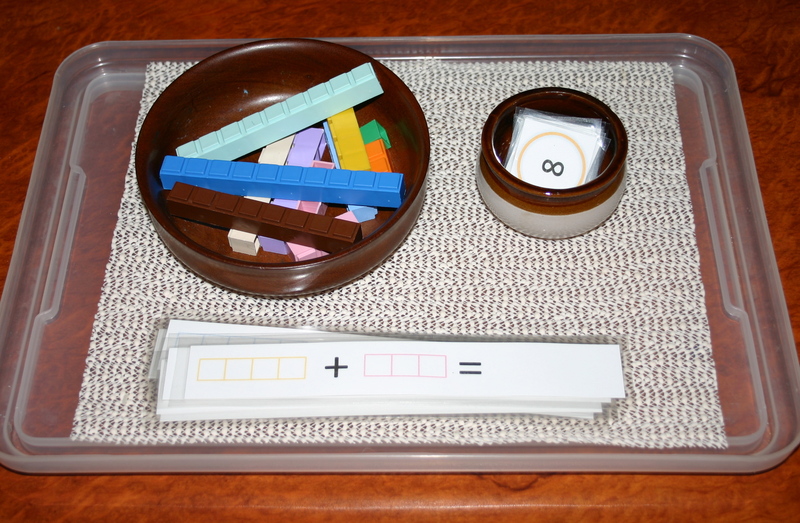 With the rocks as the manipulatives, the children solve the simple addition sum on each peg before clipping it to the correct segment on the paper plate. Using pegs means that this also improves fine motor skills as well. The circle in the centre is the inside of a used roll of sticky tape. 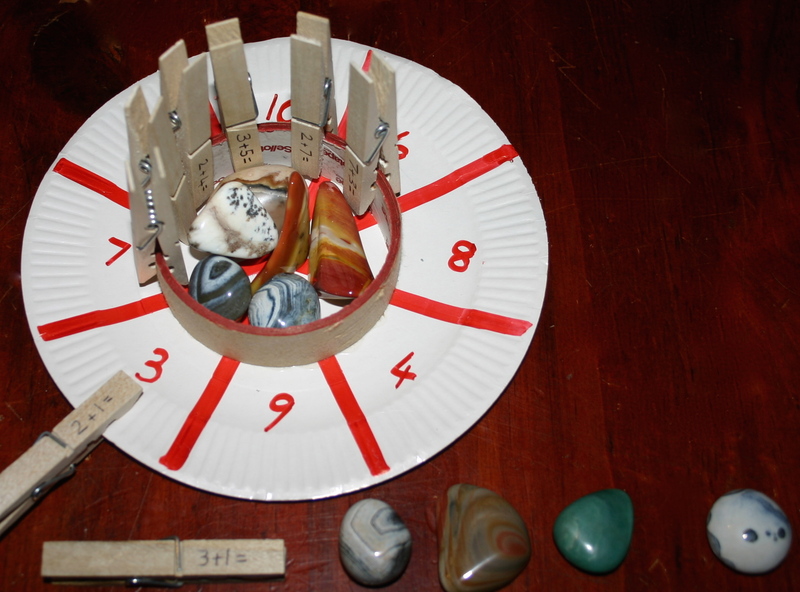 I just glued it onto the paper plate which provides a great place for the pegs and rocks to be stored when not in use. Three letter CVC words are going to be out for quite a while. With the same letter tiles and a new set of pictures (free printables here) the twins already know how to do this and need only a little help. Last time I had them lucky dip the tiles out of a bag but I found that they wanted to be able to see all the letters and find the one they needed so ended up tipping them all out anyway. 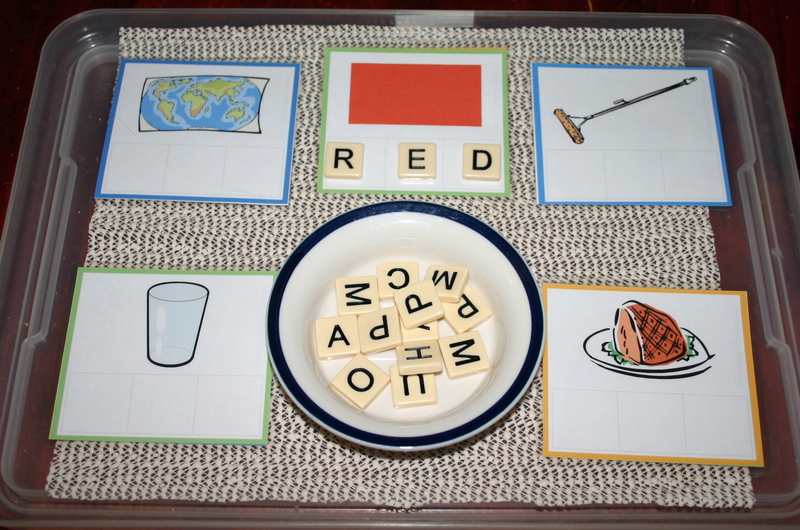 Having them in the plate means they can see the tiles and choose the sound they are up to. Almost a month exactly has passed since I last updated the twins (4 1/2 years) preschool activities. Changing them out once a month takes me an hour or two at the most (without interruptions!) and with approximately a month until I need to do it again, isn’t too much of a burden. If I take the time to plan for interesting activities then I find I have a positive attitude to “school” time and of course, with something new and interesting to do, so do they. A little internet surfing and Pinterest pinning and I have more ideas than I could possibly put into practise. The children have plenty of time during other parts of the day for play-based learning and some free choice, but school time has a little more structured. I like the activities to be hands-on where possible and try to keep in mind that we have years ahead for academic learning. Right now it is more of a priority that they learn to sit, focus, concentrate and obey my instructions than it is for them to learn a particular academic skill. This is what the school cupboard looks like this month. With the broad categories of mathematics, reading and writing in mind, we are focussing on adding small numbers, sequencing numerals to 30, identifying upper and lowercase letter names and sounds, sounding out 3 letter words, forming letters and fine motor skills. These addition strips are once of the free printables I designed to go with Mathusee Primer level. We are working on basic addition facts, this month: adding on 3 and 4. These plastic party spoons have the numerals 1 to 30 written on them. 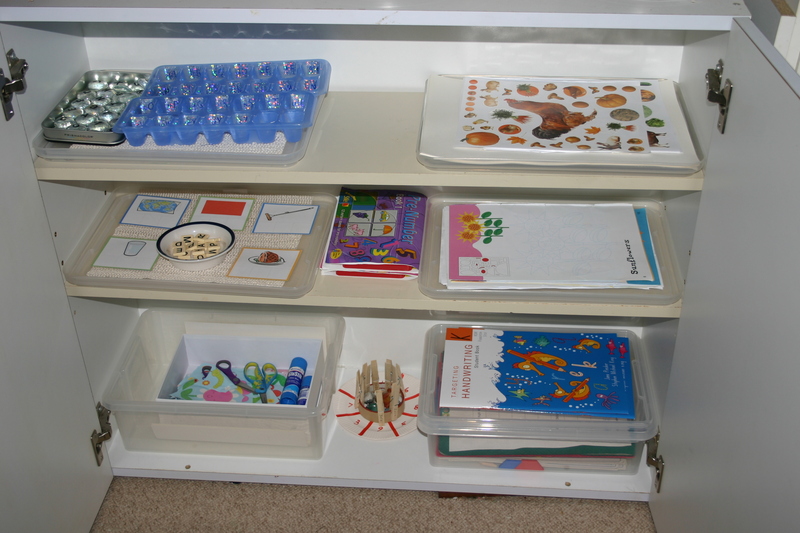 The child needs to put them in order and then post them into the right slot in the shoebox. If unsure of where to put them, they can lift up the red strip to see the numerals below. This is the favourite by far. The twins dig out the buried jewels from the rice sensory box and match the uppercase letters to the lowercase letters on the trays. 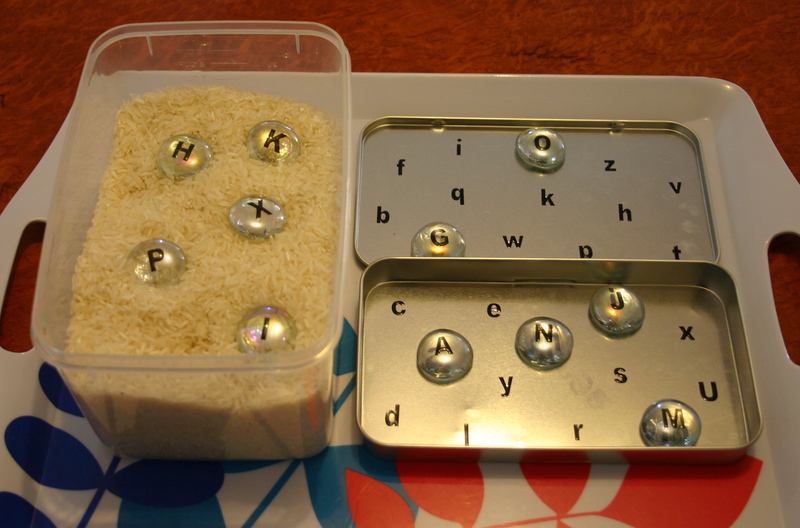 These large jewels are the kind you find for displaying flowers/candles and are a very inexpensive way of creating your own Montessori moveable alphabet. A set of black letter stickers was all I needed to purchase and with the jewels came to a grand total of $4.50. The rice I had in the cupboard from my other large sensory tubs and the metal trays are a pencil tin that my daughter no longer needed. After mastering initial sounds, we have started work on 3 letter words. 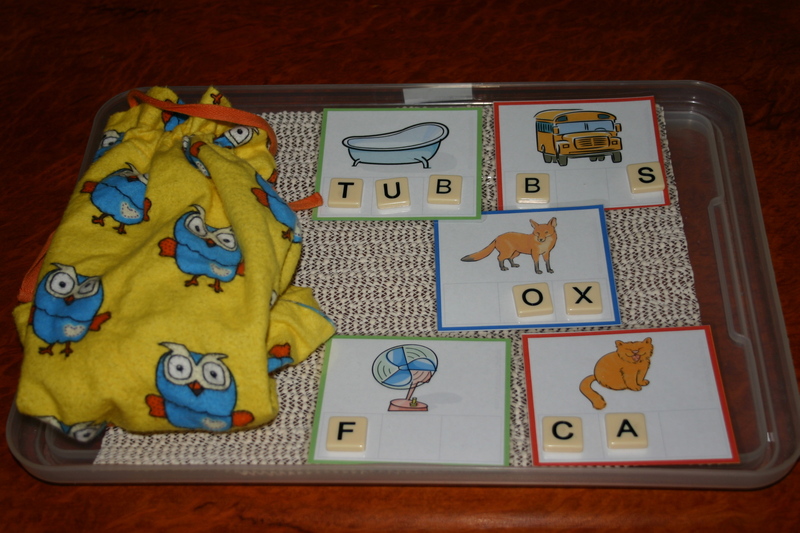 The bag holds the letter tiles which are lucky dipped and matched up to the correct space under the consonant-vowel-consonant (CVC) words. There are no spare letters so the activity is self-checking. The answer could be written on the back of the cards too but I find that my little darlings like to turn them over and cheat check if I do that! The free printable CVC picture cards are available here. This salt tray has been on my to do list for ages. All you need is a tray of some sort with a brightly coloured but plain background. Rainbow stripes or large blocks of colour will work well, but avoid busy pictures and patterns. Place a thin layer of salt into the tray, provide a paint brush and let them at it. Allow plenty of time for free “painting” first and once the novelty has worn off somewhat, add some letter cards to copy. A cue tip/ear bud will work and some people suggested just using a finger but I didn’t think the salt felt very nice. My children don’t get to paint as much as they’d like so I figured the brush would make them feel like they were doing art! One drawback of the suitcase style was that my daughter closed the lid and picked it up by the handle to pack it away. Nope, not salt tight! Oh well, sweeping up mess is educational too. Starter Styles are a commercial educational toy that we purchased years ago. The older children remember them fondly and have all sat down for a fiddle at some stage or other since they came back out. 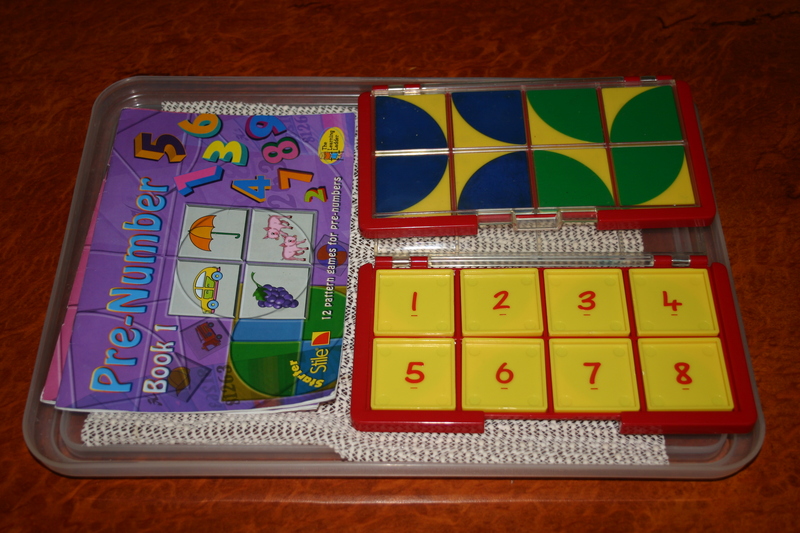 The children sequence the number tiles then use them to answer questions in the book by placing them into the correct square. 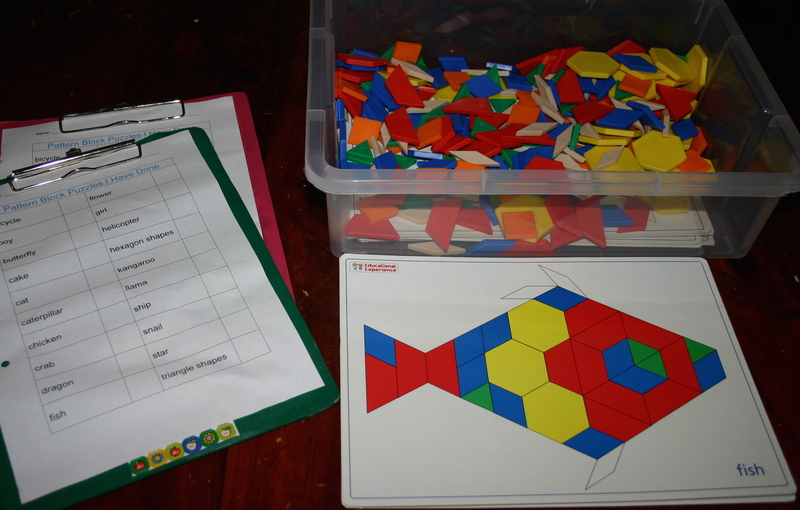 If their answers are right, the tiles will make a pattern when flipped over in the lid. The little books that go with them cover pre-number skills right on through to some more difficult concepts, as well-as pre-reading, reading and spelling. Not a must-have but a novel way of working on some basic skills. The logic required to work out how to place the tiles alone is quite difficult for little children. Threading is always good for fine motor skills. These blocks are numbered so it can be a sequencing activity also but as both my preschoolers are past this I won’t be worrying about whether it is in numerical order or not. 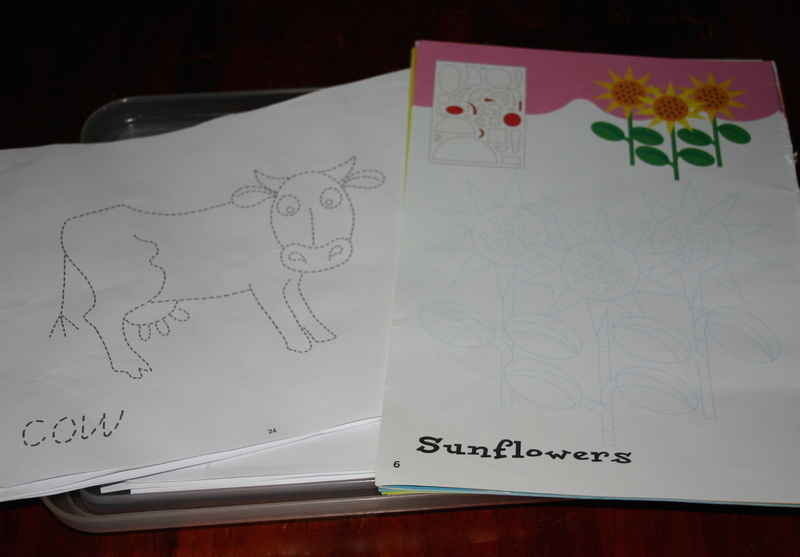 Last months preschool activities are here. The month before are here. Coming up: The monthly overhaul of the two-year-old’s highchair activity cupboard. What is your preschoolers’s favourite school-time activity?